Alligator's polite house call in South Carolina Jump to media player Footage has emerged of an alligator appearing to knock at the door of a house in the US state of South Carolina. Hunters kill enormous alligator Jump to media player Hunters kill a huge alligator on their farm in Florida. Baby alligators settle into new home Jump to media player Three months on since their birth, three baby alligators have been introduced into the home of their parents at a special zoo in Oxfordshire. Huge alligator on US golf course Jump to media player Huge alligator sat by a hole on a US golf course. It was four metres long. The reptiles often visit the course but stay well away from humans. 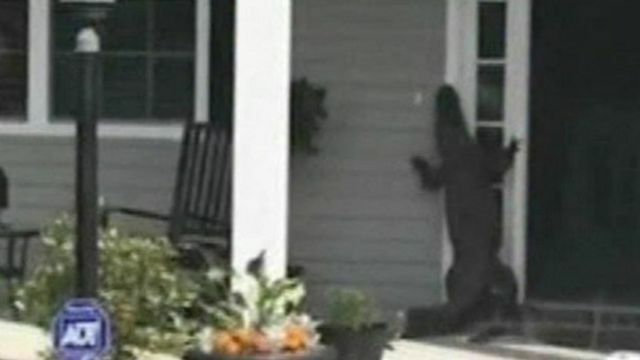 Footage has emerged of an alligator appearing to ring the doorbell of a house in the US state of South Carolina. Local resident Gary Rogers captured the moment the reptile walked in to his neighbour's front garden.